Turmeric, also referred as Haldi, has been used in India as a major ingredient in cooking for several thousand years. The botanical name of turmeric is ‘Curcuma longa’ and it forms past of curcurmin and ginger family. The benefits of turmeric have been elaborated in Ayurveda. Ayurveda uses this ingredient to treat both internal and external health ailments. 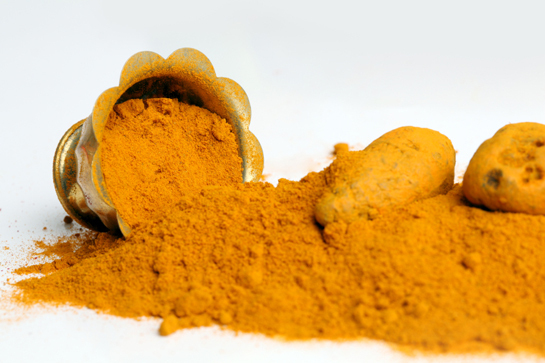 Turmeric is used in powdered form as an ingredient to add color, flavor and medicinal benefits to the foods cooked. However, turmeric can be used in raw form, just like ginger. Turmeric is mostly used in savory dishes and very rarely in sweet dishes. Turmeric is called the queen of the Ayurvedic kitchen. The kitchen without turmeric is not a kitchen and food without turmeric is not a food. Turmeric is good for all doshas, as it has great properties to pacify all three doshas. It is warm in nature. Turmeric contains anti-bacterial, anti-inflammatory and anti-aging properties. Adding a bit of turmeric powder removes off the poisonous / toxic effects (if any) from the food. It is a natural blood purifier and detoxifier. While these are well-known properties of turmeric, the optimal uses of turmeric are greatly acknowledged in Ayurvedic medicine. It is used as a major ingredient to overcome all stomach and liver problems. To treat liver disorders, gastro-intestinal disorders, aches and cramps in digestive system, in Ayurvedic medicine, Turmeric has its significance. Since turmeric is used almost every day, it prevents the development of a specific form of cancers called colon and rectal cancer. While this form of cancer predominantly affects people in rest of the world, people in a few south Asian countries like India, Nepal, etc stays away from developing colon or rectal cancer due to regular use of turmeric. Besides medicine properties, turmeric is widely used as a beauty ingredient. It is a boon for skin health and the medicinal elements treats the skin blemishes, acne, scars, etc providing a glowing skin. Thanks for sharing this article it was very helpful .Turmeric is good for all doshas and is highly curing substance.